Royalties: one word that is simultaneously exciting and terrifying to every musician out there. Royalties means money, but other than that, what are they? It is surprising how few musicians actually know what royalties are, let alone how they are collected or by whom. Performance royalties – the money you're entitled to when your song is broadcast or performed publicly in some way – are collected by performance rights organizations, or PROs. There are four main players in the United States that are all worth knowing about: ASCAP, BMI, SESAC, and SoundExchange. 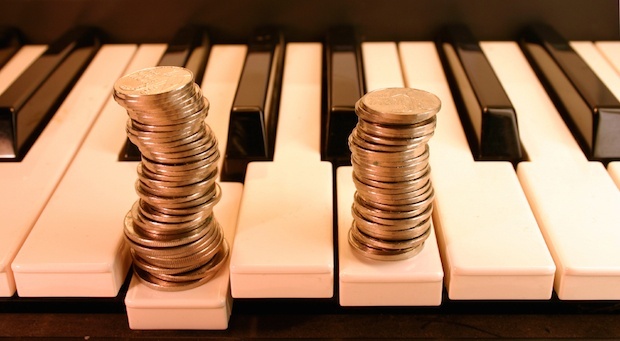 Before delving into a bit more about each, it is important to know that there are two kinds of royalties: those that songwriters collect, and those that performing artists collect. A songwriter is the one responsible for the lyrics and the melody of the song, and the performing artist is the one who sang or played said music. A good example of the difference between the two is the famous Titanic soundtrack cut, “My Heart Will Go On.” The song, which was a major smash around the world and which sold millions upon millions of copies, has two different parties that made it what it is: Celine Dion, and the group of men who wrote and composed the track. The two are not the same, and thus they get paid from different kinds of royalties. Essentially, PROs collect royalties every time a work is performed publicly, meaning anytime a song is played on the radio, in a restaurant, at a football game, you name it. If a song is being broadcast to an audience, those that are licensing it (the sports arena, the music venue, the restaurant) must pay a royalty, which goes to the PRO. From there, the money is split between the songwriters and publishers, who manage the copyrights of the music on the behalf of artists. Here’s a bit about each of the four biggest organizations in the US involved in collecting and distributing performance royalties. The American Society of Composers, Authors, and Publishers (ASCAP) is the oldest of the three PROs, and is responsible for collecting royalties for almost half a million songwriters and composers. Like BMI and SESAC, the royalties collected by ASCAP are only paid out to songwriters, composers, and publishers (which can control the rights of said copyrights). So, these three organizations aren’t worried about money for Celine Dion; they are collecting on behalf of James Horner (and his partners), who were responsible for writing the song. Last year, ASCAP celebrated its one hundredth birthday by collecting $1 billion for the first time. Just a few years younger than ASCAP, BMI (Broadcast Music, Inc.) is growing rapidly, and 2015 was an impressively massive year. The organization followed just behind ASCAP in collecting $1 billion this past fiscal year, making the two almost even. Most American songwriters and publishers choose between these two big names in the industry for their royalty-collecting needs. It's important to note that SESAC (Society of European Stage Authors and Composers) is different in that while ASCAP and BMI operate on a not-for-profit basis, this option does not. SESAC is a for-profit operation, but please don’t start thinking that the organization is all about making as much money as possible for just itself. For-profit might sound bad, but in the end it could mean more bucks for you, as the company might be more inclined to work harder if there’s more money in it for them. SESAC’s revenues are much smaller than ASCAP and BMI, even though it is making profit. While both of the other PROs mentioned beforehand now collect over $1 billion a year, SESAC is still bringing in less than $200 million, though it's still growing. SoundExchange is different from the other three organizations on here as it only collects royalties for songwriters from digital platforms. So, when a song is played on Pandora (it only works with those streaming options that are not on demand), money goes straight to SE, thanks to a handful of laws that were created right around the time that the internet began taking over. Having said that, SoundExchange is free to negotiate the royalty rates for its clients, whereas the amount of money ASCAP, BMI, and SESAC can collect for a play of their client’s music is set by courts, and is non-negotiable.